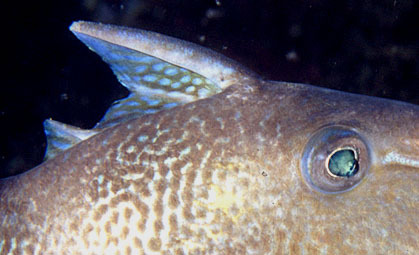 All trigger fishes are characterised by an unusual dorsal fin arrangement. The first dorsal spine is very strong and is so arranged that it is connected in function with the second spine. The fish wedges itself into a crevice for safety and secures itself there by erecting the strong first spine and locking it into position with the second. When the second spine is depressed it acts as a trigger to unlock the first spine.